This spring the community of Liberty hosted a wonderful visitor from New Orleans - the Spirit of Louisiana steam engine. During the months of May and June the steam train was visited by thousands of people. The train then moved on to Kearney, Missouri for their 150th birthday celebration. I was able to visit the train on two occasions - during our Spring Festival and then later in June before they left. This episode contains some interviews during the Spring Festival. Be sure to check out the show notes as well. 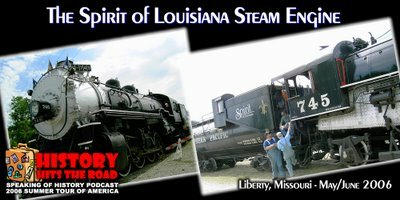 The Kansas City Star newspaper did a great video on the train while it was in Liberty and you can stay in touch with the travels of the train after its stay in the Liberty area. It was such a great experience to see an authentic part of American history. If you have any comments or questions please contact me at speakingofhistory@gmail.com or leave a comment of this post.